Are you interested in attending Cleveland State? If so, the time to start applying is now. We have made the process easier than ever before as you will be assigned a Success Coach to walk you through your first 24 hours of registration and then you will be assigned an academic advisor to help you finish your goal of earning a college degree. Apply today by clicking on www.clevelandstatecc.edu and click the Apply Now button. All students are required to turn in a Proof of US Citizenship. Below is a listing of items that can be used to satisfy the requirement. Students should bring in the above mentioned document(s) to the Success Coach or Enrollment Services Specialist. Faxed copies of required documents cannot be accepted, and will not complete the Admissions requirement. All transcripts must be submitted in official, sealed envelopes or via the institutions electronic process. Scanned copies will not be accepted unless they are sent directly from the school or institution. The following information is not intended to be a complete list of requirements. There are a number of different types of admission categories and all applicants are reviewed on an individual basis depending on the category of admission. For additional information please refer to the catalog or call the Enrollment Services Center at 423-473-2310 or 800-604-2722, extension 310. Submission of an official high school transcript from a state-approved or regionally approved high school, including graduation date and cumulative GPA. GPA must be included on transcripts with a graduation date of 2003 or later for Hope Scholarship eligibility. Transcripts of applicants who graduated from Tennessee public high schools in 1983 or later must include a notation that the student passed the required proficiency examination. If applicants have not passed the required proficiency test, they must submit an official HSE score indicating a successful completion before being considered for regular admission. A Tennessee home-schooled student must submit an official high school transcript from an affiliated organization as defined by state law (T.C.A. 49-50-801) or be accompanied by certification of registration with the superintendent (Director of Schools) of the local education agency that the student would otherwise attend. Transcripts from states other than Tennessee will be evaluated on an individual basis. Submission of official ACT or SAT scores if the high school graduate is under the age of 21. Placement into appropriate English, math and reading courses is determined by ACT scores earned within the previous five years. SAT scores are converted to ACT scores. Submission of official HSE (General Equivalency Diploma) test scores indicating successful completion of the diploma. Submission of official ACT or SAT scores if the HSE recipient is younger than 21 years of age. SAT scores are converted to ACT scores. Submission of an official high school transcript verifying graduation and date diploma conferred, if the total previous college credit hours are less than 60. Submission of official transcripts from each college or university attended. Concealment of previous college or university attendance may be cause for rejection, cancellation of admission, or dismissal of the student. GPA of all courses taken at other schools must be equal to or greater than the progression standards of Cleveland State Community College. Students not meeting this criterion may be admitted on scholastic probation. A student on academic probation or suspension from another institution may be granted conditional admission to CSCC. Transfer students are subject to the general academic retention standards of the college as stated in the college catalog. Transfer students who have successfully completed a college-level English and/or mathematics and/or reading intensive course are exempt from academic placement testing. Transfer students whose ACT or SAT scores demonstrate appropriate levels may be exempt from academic placement testing. NOTE: Only ACT or SAT scores less than five years old as of the first day of the first term of enrollment are used to determine exemption status. *All transfer students seeking financial aid are recommended to check with the Financial Aid Office. If transferring in 60 hours or more it is HIGHLY RECOMMENDED you speak with a Financial Aid Counselor before enrolling. All international applicants whose native language is not English are required to take the Test of English as a Foreign Language (TOEFL). A minimum score of 500 on the paper exam, 173 on the computerized exam, or 61 on the Internet-based exam is required. Official TOEFL scores must be submitted. Students may also satisfy this English proficiency requirement by submitting a transcript showing graduation from an American high school or another U.S. institution showing satisfactory completion of English composition. 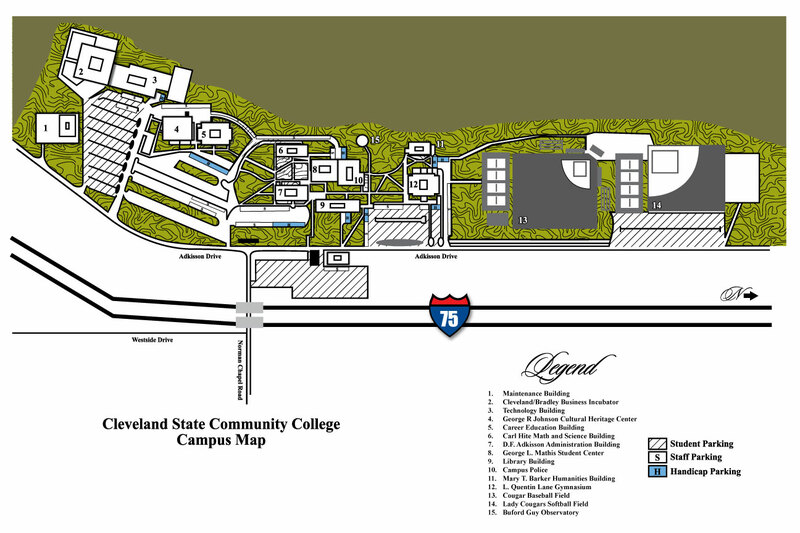 Evidence of financial resources adequate for all expenses while enrolled at Cleveland State Community College. For the first year, international student fees are estimated to be approximately $22,150. This figure is only an estimate and is subject to change. Certificate from a licensed physician or other qualified medical authority verifying freedom from tuberculosis. International students are subject to the same policies regarding academic placement tests as transfer students. International students are required to have hospitalization insurance prior to completing registration. Complete and submit a Transient Approval Form and provide documentation for EVEA requirements. For courses with prerequisite requirements, the home institution must specifically identify the approved course or the home institution must provide evidence of completion of the prerequisite by transcript. Submission of a completed application for readmission if student has not attended CSCC during the past three semesters and/or has graduated. May need to submit documentation to meet immunization and EVEA requirements. Submission of transcripts from all colleges attended since the last enrollment at CSCC. Completion of academic placement test if required.